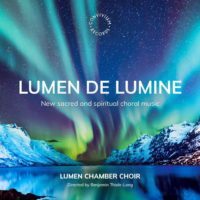 The London based amateur chamber choir Lumen, directed by Benjamin Thiele-Long, has released a fascinating disc of new unaccompanied choral works. The recording is the result of a great project to create a platform for new composers of sacred and spiritual choral pieces. Thiele-Long and the choir selected the composers via a successful kickstarter campaign, and as a result, they have recorded brand new pieces by twelve different composers. The range of styles is impressive, yet all the works would be accessible for most good amateur choirs, so it provides a great opportunity for choirs who are looking for something new. You can read more about the project and some of the composers on my blog, but the works on offer here range from the simple but effective harmonies of Sam Olivier’s ‘There is no dusk to be’, to the more challenging, surging chromatic lines and jazzy harmonies of Simon Whiteley’s ‘The Way of Life’. Eastbourne-based composer Clive Whitburn’s ‘Who is my neighbour?’ puts biblical texts from Luke and Matthew up against data on migrant deaths, contrasting the pulsing, chanting statistics with a keening soprano line, somehow adding to the moral challenge through the simplicity of its melody. And Joanna Gill’s ‘Safe in the arms of He’ is equally moving, in its touchingly intimate setting of a text written by parents on the death of their son from cancer. The thirteen-strong choir show incredible versatility in tackling such a broad range of styles and moods, and despite some occasional tuning issues in a few of the more stretching pieces, they give committed and convincing performances throughout. Inevitably with a range of new compositions such as this, one will be drawn to some more than others, but this is an impressive display of new choral composition talent, and I hope that other choirs will pick up many of the pieces. Do check out my blog for more on the pieces, with links to videos about the composers and their works.